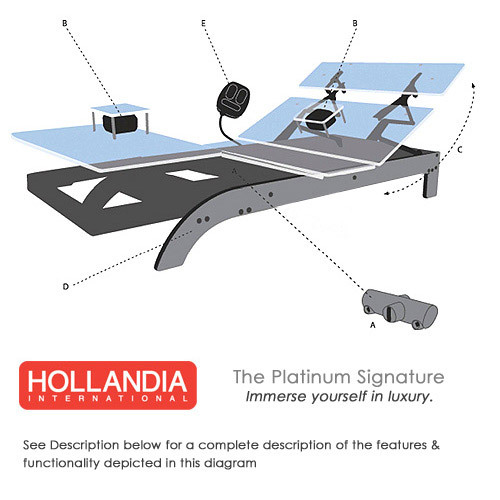 The Elite Bed from Hollandia is built on their signature Platinum-Luxe base, which was designed using the most advanced technology and materials. Manufactured in Israel, Hollandia International’s bed base design is widely regarded as one of the most state-of-the-art sleep systems in the world. The Platinum-Luxe Elite Bed combines style, safety, digital multimedia and over-the-top comfort functionality, delivering the most brilliantly constructed, luxurious, entertaining, comfortable and full-featured bed we have ever seen. The Elite Bed from Hollandia ships consists of two individually adjustable bases and vitaly latex matresses. A. Motors - Manufactured in Germany by Hanning. At half a horse power each, the motors are quick, powerful, and extremely quiet. Manual reset function available in case of electrical failure. There are two motors for the head and feet and two motors for massage. B. Massage System – Rest is enhanced with the 12 unique programs powered by two massage motors. With a memory system that will remember your last setting. Automatic shutdown after 30 minutes. C. Back Sliding System - The bed slides back up to one foot, allowing you to maintain eye contact with your partner and keep proximity to your nightstands while your upper section is raised. D. The Framework - Made of steel and HPL. The grainy texture painted onto the steel surface eliminates rusting or scratching. HPL is a resin-impregnated layered craft paper which is durable, non-porous, non-toxic, humidityand fire- resistant. The state-of-the-art material, Ecolon, is layered between the metals to eliminate friction without the oil or grease. The Ecolon will not wear out. E. Hand Control – The simple, ergonomic hand control is pneumatic, which means it operates exclusively by air pressure under any situation. No batteries or electricity are required. Even when disconnected, blowing into the cord will activate the bed! The hand control also glows in the dark for your convenience.